SARFAESI—Suit for Partition during pendency of proceedings under SARFAESI—Debt Recovery Tribunal has been empowered to decide the question of title and partition of the property. Comments Off on SARFAESI—Suit for Partition during pendency of proceedings under SARFAESI—Debt Recovery Tribunal has been empowered to decide the question of title and partition of the property. SARFAESI—Counter Claim—Suit by borrower claiming certain transaction being sham, null and void—DRT has no jurisdiction to entertain such claims. Comments Off on SARFAESI—Counter Claim—Suit by borrower claiming certain transaction being sham, null and void—DRT has no jurisdiction to entertain such claims. V IMP::: Advocates—Disciplinary proceedings cannot be initiated by State Bar Council against an Advocate for the acts unrelated to professional conduct. Comments Off on V IMP::: Advocates—Disciplinary proceedings cannot be initiated by State Bar Council against an Advocate for the acts unrelated to professional conduct. SARFAESI—Forfeiture of deposit of auction purchaser by Bank—Auction Purchaser can challenge the action before DRT and not High Court. Comments Off on SARFAESI—Forfeiture of deposit of auction purchaser by Bank—Auction Purchaser can challenge the action before DRT and not High Court. SARFAESI—Jurisdiction of Civil Court—Civil suit for partition of property would not be maintainable in a situation where proceedings under the SARFAESI Act had been initiated. Comments Off on SARFAESI—Jurisdiction of Civil Court—Civil suit for partition of property would not be maintainable in a situation where proceedings under the SARFAESI Act had been initiated. Recovery of Debt—Bank can recover the amount paid by it by way of forged cheque/demand draft through DRT. Comments Off on Recovery of Debt—Bank can recover the amount paid by it by way of forged cheque/demand draft through DRT. DRT—Appeal—DRT has no power to condone the delay in filing appeal against order of Recovery Officer. Comments Off on DRT—Appeal—DRT has no power to condone the delay in filing appeal against order of Recovery Officer. Tender Bid—Duly signed bid—Digital Signatures-Held; as per instructions of bid bidder was liable to digitally sign all the documents- -it is reasonable to presume that what the parties meant by digital signatures was a digital signature as defined in the Information Technology Act. Comments Off on Tender Bid—Duly signed bid—Digital Signatures-Held; as per instructions of bid bidder was liable to digitally sign all the documents- -it is reasonable to presume that what the parties meant by digital signatures was a digital signature as defined in the Information Technology Act. Alternate remedy-Writ against order of DRT–Borrower offered to pay Rs. 6 lakhs by 30.03.2016–Bank directed to take formal possession and not to dispossess the borrower-Borrower directed to further pay Rs 2 lakhs by 12.4.16–lnterim relief granted to file appeal. Comments Off on Alternate remedy-Writ against order of DRT–Borrower offered to pay Rs. 6 lakhs by 30.03.2016–Bank directed to take formal possession and not to dispossess the borrower-Borrower directed to further pay Rs 2 lakhs by 12.4.16–lnterim relief granted to file appeal. Trade Marks—Infringement of—Plaintiff had registered trade mark “MOHUN’S”—Defendant adopted trade mark “MOHAN’S” for same description of goods—Injunction granted by trial court in favour of plaintiff set aside. Comments Off on Trade Marks—Infringement of—Plaintiff had registered trade mark “MOHUN’S”—Defendant adopted trade mark “MOHAN’S” for same description of goods—Injunction granted by trial court in favour of plaintiff set aside. Symbolic Possession-Interim Injunction-Ad interim order by Civil Court in an injunction suit is not an embargo against exercising the power under S. 14 of the Act. Comments Off on Symbolic Possession-Interim Injunction-Ad interim order by Civil Court in an injunction suit is not an embargo against exercising the power under S. 14 of the Act. Punjab Package of Incentives, 1992-lnvestment Incentive (subsidy)– If a unit is sold then the amount of subsidy sanctioned for that unit is to be released to purchase unit. 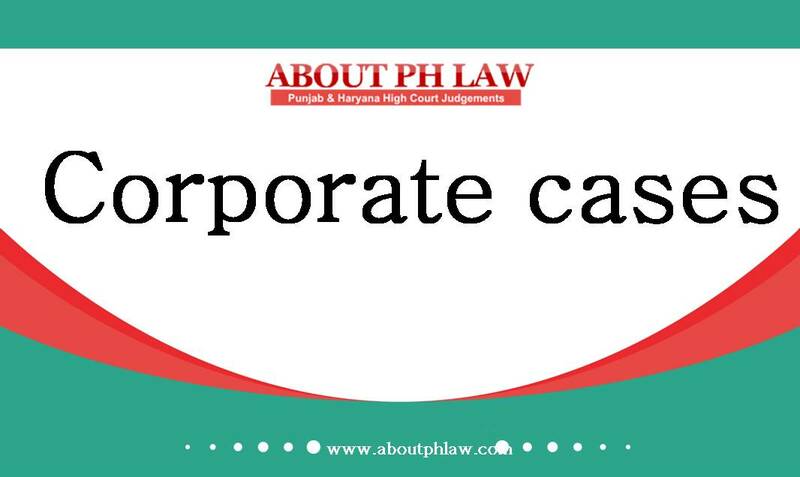 Comments Off on Punjab Package of Incentives, 1992-lnvestment Incentive (subsidy)– If a unit is sold then the amount of subsidy sanctioned for that unit is to be released to purchase unit. Societies—Mid-term Polls—Administrator has the power to hold the elections before the expiring of its term when the governing body, once elected, is out of power. Comments Off on Societies—Mid-term Polls—Administrator has the power to hold the elections before the expiring of its term when the governing body, once elected, is out of power. Security Interest (Enforcement) Rules, 2002, R.8–Auction Sale-Symbolic Possession-No advertisement was published in the newspaper in terms of Rule 8(2) of the Rules and no possession notice under Rule 8(1) was affixed on the said property-Auction Sale though confirmed but set aside-Sale certificate quashed. Comments Off on Security Interest (Enforcement) Rules, 2002, R.8–Auction Sale-Symbolic Possession-No advertisement was published in the newspaper in terms of Rule 8(2) of the Rules and no possession notice under Rule 8(1) was affixed on the said property-Auction Sale though confirmed but set aside-Sale certificate quashed.